Life in heaven does not compare to how we live upon the earth. There is a great lesson of how it will be in heaven when the sadducees who did not believe there was a resurrection and they posed the question to Jesus of how Moses said of the woman who after being with seven brothers to raise up seed unto their name died then whose wife will she be in heaven? Jesus reply tells us just how different life in heaven is for marriage is not a part of one’s life as in Spirit we live unto the Lord, for the voice of the bridegroom and bride will not be heard in heaven. (Luke 20:27-38) Then came to him certain of the Sadducees, which deny that there is any resurrection; and they asked him, Saying, Master, Moses wrote unto us, If any man’s brother die, having a wife, and he die without children, that his brother should take his wife, and raise up seed unto his brother. There were therefore seven brethren: and the first took a wife, and died without children. And the second took her to wife, and he died childless. And the third took her; and in like manner the seven also: and they left no children, and died. Last of all the woman died also. Therefore in the resurrection whose wife of them is she? for seven had her to wife. And Jesus answering said unto them, The children of this world marry, and are given in marriage: But they which shall be accounted worthy to obtain that world, and the resurrection from the dead, neither marry, nor are given in marriage: Neither can they die any more: for they are equal unto the angels; and are the children of God, being the children of the resurrection. Now that the dead are raised, even Moses shewed at the bush, when he calleth the Lord the God of Abraham, and the God of Isaac, and the God of Jacob. 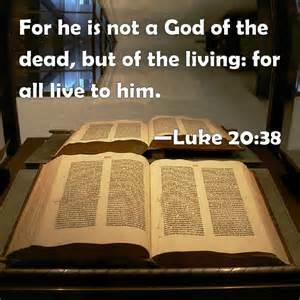 For he is not a God of the dead, but of the living: for all live unto him…… (Revelation 18:23,24)……. (Matthew 25:1-13)……. (Revelation 19:6-9). As a Christian we know “For me to live is Christ, and to die is gain”. (Philippians 1:21), we are crucified with Christ: yet we live! (Galatians 2:20). I am crucified with Christ: nevertheless I live; yet not I, but Christ liveth in me: and the life which I now live in the flesh I live by the faith of the Son of God, who loved me, and gave himself for me. Sin is the sting of death to man, and to continue in sin brings death to the soul. Praise God we have the victory through Christ when we repent and live unto Him! (1 Corinthians 15:55-58). O death, where is thy sting? O grave, where is thy victory? The sting of death is sin; and the strength of sin is the law. But thanks be to God, which giveth us the victory through our Lord Jesus Christ. Therefore, my beloved brethren, be ye stedfast, unmoveable, always abounding in the work of the Lord, forasmuch as ye know that your labour is not in vain in the Lord. ← Need More ANOINTING ?